Do you own a WordPress blog which has become very popular and now getting thousands of views and visits and now you want to start guest blogging on it? Then read on as you will get all the information about how to start guest blogging in your WordPress blog. You may be looking for some guest blogging plugins which can make things easier for you. There are actually some amazing plugins which are useful for guest blogging which make all the tasks related to guest posting quite easier. Although Google never supported the backlink related game and the golden effect of guest blogging has diminished but still it is one of the most effective ways to grow your audience and increase your good backlinks and traffic. There are many bloggers who are using it to grow their online revenue and email list. Hence by harnessing the power of guest posting you can boost your blog’s exposure and it will grow your online presence. Now we will discuss about some of the must have guest blogging WordPress popular plugins for WordPress users. These plugins will make your work much easier if you are introducing guest blogging on your blogs. This plugin sends automatic notification via email to the guest bloggers about the status of their guest post i.e. Whether it is in pending state, scheduled state or it has been approved. This plugin also notifies them about the change in status of their guest post if any like if their guest post has moved from pending status to approved or from pending to draft etc. The blog owner will get notifications about the new guest posts which are submitted and the blog posts which have been published. If you will use this plugin then things will become lot more smooth for you. In past you must have sent manually email to guest bloggers about their guest post status. After using this plugin you don’t need to email them about any kind of notification. Also you don’t need to go to your WordPress panel again and again to check if there are new guest posts waiting. Using Peter’s Collaboration Email plugin, you will get instant notification on your email address if a new guest post is submitted. This plugin works amazingly well in association with Peter’s Collaboration Emails plugin. Using this plugin, you can easily add notes at edit post and also edit page level for yourself and for others. This plugin is useful in so many situations like when you are reviewing a guest post on your blog and if you find anything which is missing in that post then you can add a note against that guest post for its guest blogger. These notes are sent with the emails in the collaboration workflow. This is an easy to use guest blogging plugin which can help you to easily manage all of your guest post submissions. The good thing about using this plugin is that using this plugin your site users can easily submit guest posts and images or any multimedia material from the front-end of your WordPress website. This is very useful. By using this plugin you can allow your website visitors to submit posts from anywhere on your website. You will get option to make submitted images as featured images and also an option to use WordPress’s inbuilt rich text editor for post content. Your guest post submissions can include title, category, tags, url, author, post and images. This plugin helps in redirecting user to anywhere or return to current page after he successfully submit the post. This plugin also includes a group of template tags for displaying and to customize the user submitted posts. Most of the bloggers ask to guest bloggers to send their post via email or in MS Word format. Although there is nothing wrong in this but it increases the amount of work for the editor. Better options is to enable registration on your WordPress blog and let the authors submit posts directly from the WordPress dashboard. You can use the User Role Editor plugin to control what access the authors of the posts will get. When you will enable registration the you can also face the issue of spam registration and spam post submission. To tackle this, you can install the WangGuard WordPress plugin. WangGuard protects each website from spam registrations and posting in a personalized way using the information provided by admins. The longer you use WangGuard, the more effective it will become. Upon user registration, WangGuard will check whether the user is a Splogger or spam user, If it finds that use is a Splogger then it will not allow the registration on your website. WangGuard cleans your database from sploggers and spam users. 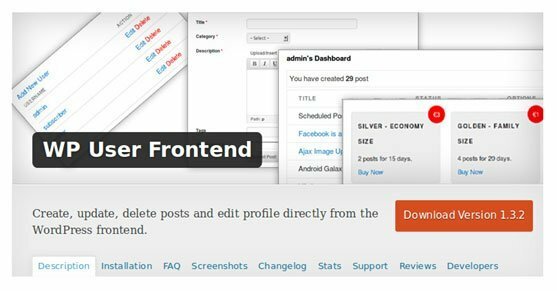 WP User Frontend offers you the mot features for free than the other frontend post submission plugins available. The forms give users the ability to create new posts, edit their profile all from the website frontend, so that there is no need for the user to enter the backend admin panel to do the same. Users can upload files, fill the forms, entry data with multiple choice menus. As all the forms are created as a custom post hence our post management can allow the users to update their posts from the frontend. This plugin allows you to work on any platform like WooCommerce. The users can easily create a new post and edit if from the frontend. Uses can view their page in frontend custom dashboard. Administrator can restrict any user to access the WordPress backend. Admins can manage users from frontend. We have just discussed the top 5 WordPress plugins which are very helpful in guest blogging. You can choose any one plugin from these to use whether you are already accepting guest posts or planning to accept them on your blogs. As this plugins have many features hence you will like them. Good thing is that all of these plugins are freely available from WordPress official plugin website. We hope that these guest blogging plugins will help you to smoothly do the guest blogging process on your WordPress blog. Sophia Phillips has been working as a professional in Wordprax, WordPress plugin development company and loves sharing information about leveraging multiple benefits of WordPress in the best possible manner. Currently, she has an impressive count of WP- related articles under her name.